Adults of this species range from 15 - 65 inches long, ( 38 - 165 cm) but typically the adults seen are 3 - 4 feet long. Newborns are around 10 inches long. A heavy-bodied, venomous pit viper, with a thin neck and a large triangular head. Pupils are elliptical. Scales are keeled. Two light stripes extend diagonally across the sides of the head, but they are sometimes faded and not evident. The ground color is variable, matching the environment - pale grey, tan, light yellow, buff colored. The back is marked with dark blotches with light centers, usually in the shape of bars or ovals, about as wide as the spaces between them. The underside is pale, sometimes weakly mottled. The tail is barred, and without white rings. A rattle, consisting of loose interlocking segments, usually occurs at the end of the tail. A new rattle segment is added each time the skin is shed. Newborn snakes do not have a rattle - just a single button which does not make a sound. Prey is found while the snake is actively moving, or by ambush, where the snake waits near lizard or rodent trails, striking at and releasing passing prey. The snake then follows the trail of the envenomated animal and swallows it whole. Eats small mammals, including ground squirrels, mice, rats, rabbits and hares, birds, lizards, snakes, frogs, and insects. This subspecies, Crotalus oreganus lutosus - Great Basin Rattlesnake, is found in California in the far northeastern corner and in a small region east of the Sierras near the Mono Lake area. It continues outside the state north into eastern Oregon, and east to western Utah, southern Idaho, most of Nevada, and barely into extreme northwestern Arizona. 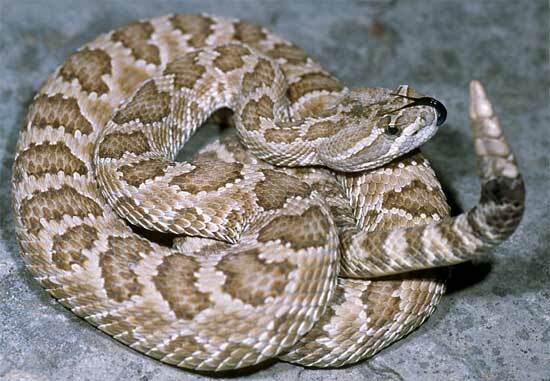 The species Crotalus oreganus - Western Rattlesnake, occurs from the Pacific Coast of northern Baja California north through most of California except the southern deserts, through Oregon and eastern Washington into British Columbia, Canada, and east into Nevada, Idaho, Utah, northern Arizona, extreme southwestern Wyoming, and extreme northwestern New Mexico. Inhabits rocky hillsides, barren flats, sagebrush, grassy plains, and agricultural areas. Some researchers still use the species Crotalus viridis and this snake remains Crotalus viridis lutosus .